vitamins and with a high fibre content. Emmer wheat flour has been in use since ancient times and is especially suitable if you have difficulty in digesting bread, pasta and other durum or common wheat based products. This flour is obtained by milling the caryopses of the Triticum genus and is rich not only in proteins, mineral salts and vitamin B, but also contains methionine, an essential amino acid not found in other cereals. It helps produce carnitine, cysteine, lecithin, taurine and other phospholipids. Emmer wheat flour has a high fibre content which helps regulate intestinal transit and preserve the ability to absorb water. 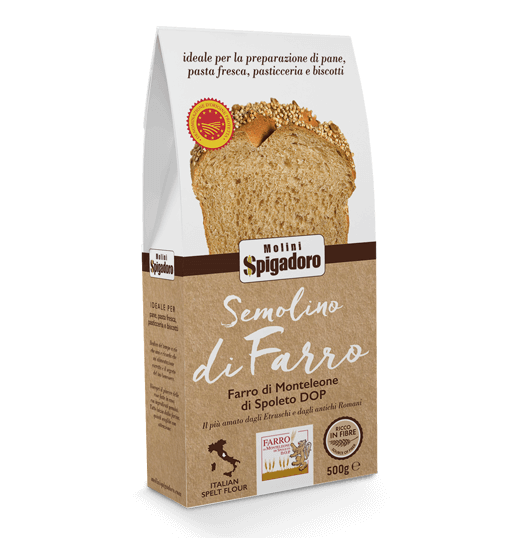 The significant fibre content makes this flour especially suitable if you are on a diet because the fibre swells in your stomach, making you feel full more quickly and helping you to eat less. Moreover, since it is rich in vitamins, mineral salts and proteins, emmer wheat flour has a very high nutritional value, but a lower calorie count compared to refined flour, due to a lower concentration of starch. Its high protein and mineral salt content, especially iron, has a positive effect from a physiological and dietary point of view. The emmer wheat used for flour production undergoes a single process, dehusking, which consists of removing the outer layers from a single grain, but maintaining a good percentage of fibre and nutritional values. The milling is then done on the naked grain which thus conserves most of the original nutritional characteristics. 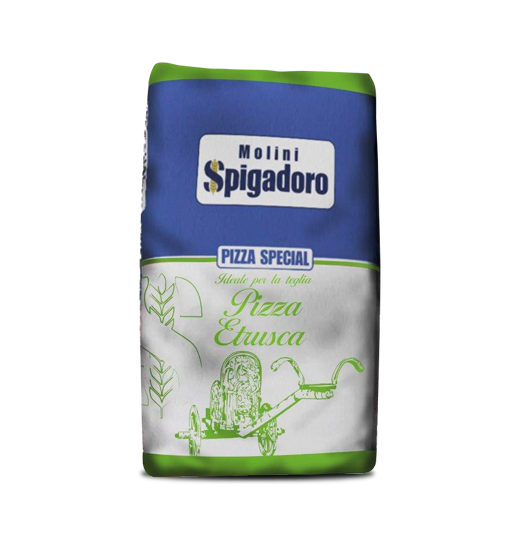 Molini Spigadoro flour maintains most of the original nutritional characteristics of the emmer wheat because it is obtained by milling the dehusked grain with a traditional mill. Our emmer wheat flour is characterised by a unique taste that is transferred to mixed doughs as well. Regardless of whether it is used on its own or combined with other more refined flours, there is no doubt that emmer wheat flour is excellent for making bread, pasta, appetisers and delicious baked goods, such as rustic cakes, tarts, muffins and biscuits with a unique, aromatic flavour.